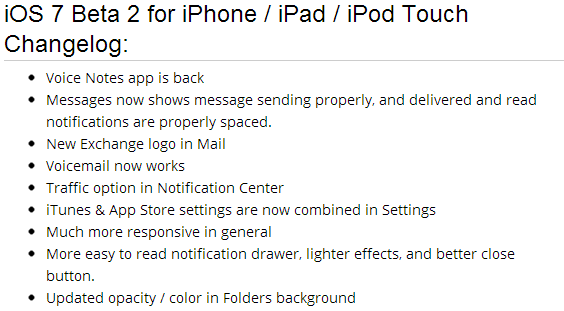 Apple iOS 7 Beta 2 (Build: 11A4400f) for iPhone 5, iPhone 4S, iPhone 4, iPod Touch 5G, iPad 4, iPad 3, iPad 2, iPad Mini and Apple TV 2G/3G is now officially available for iOS Developers and iOS General Users. 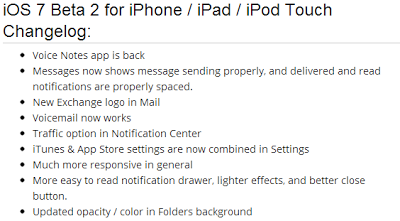 iOS 7 Beta 2 Firmware for iPhone, iPad, iPod Touch & Apple TV 2G/3G contains several new software changes, performance improvements and bug fixes. Torrent/Direct Download Links of iOS 7 Beta 2 IPSW Firmware for iPhone 5, iPhone 4S, iPhone 4, iPod Touch 5G, iPad 4, iPad 3, iPad 2, iPad Mini and Apple TV 2G/3G is also available below for non-iOS developers and if you're iOS Developers than you can officially Download and Install iOS 7 Beta 2 IPSW Firmware (Build: 11A4400f) from iOS Dev Center website.